Zola Jesus - Conatus. Vinyl LP. Bleep. It’s something that bears repeating; Nika Roza Danilova - AKA Zola Jesus - was a maverick genius right from the beginning. Emerging to critical acclaim at a young age with 2009’s The Spoils, her hypnagogic synth pop - electrified by her trademark booming vocal - had matured long before her third full-length release, 2011’s Conatus. 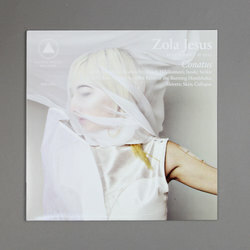 The album is an essential document of her continuous rise, flaunting the diversification of the Zola Jesus sound, from classic-era 4AD darkwave to soaring orchestra arrangements.